This book is a revised and updated edition of a major work first published in 2001 under the auspices of the Intellectual Property Committee of the International Bar Association. As a comparative cross-jurisdictional analysis of the practice, theory, scope, and types of design protection, it will continue to be of immeasurable value to lawyers and others involved in industrial design. Industrial designs are particularly interesting because the laws in many countries attempt in different ways to find a balance between protection for the artistic and freedom to use the purely functional, and between the proprietary rights of the creator and the public domain rights of the competitor. expunging, cancelling, or varying registration. Prominent new developments covered in the second edition include the continuing impact of the European Community Design Directive, the adoption of the Hague Convention with corresponding major changes to US and Canadian design law and practice, the new German Design Law, and China’s new Guidelines for examination. Each jurisdiction’s currently applicable legislation, regulation, and case law is summarized and analysed. CHAPTER 1 Industrial Design Rights: Argentina Pablo Käufer Barbe. CHAPTER 2 Industrial Design Rights: Australia Sue Gilchrist, Stuart Irvine & Melissa Goode. CHAPTER 3 Industrial Design Rights: Brazil Roberta Arantes Lopes & Rafael Cordoville Freire. CHAPTER 4 Industrial Design Rights: Canada Brian W. Gray, Christopher N. Hunter & Rita Gao. CHAPTER 5 Industrial Design Rights: China Mike Chen, Jenny Li & Ying Zhang . CHAPTER 6 Industrial Design Rights: Europe Kurt Stöpetie & Rutger Stoop . CHAPTER 7 Industrial Design Rights: France Alexandra Neri. CHAPTER 8 Industrial Design Rights: Germany Uwe Lüken. CHAPTER 9 Industrial Design Rights: India Sudhir D. Ahuja. CHAPTER 10 Industrial Design Rights: Italy Luigi Pavanello. CHAPTER 11 Industrial Design Rights: Japan Hiromichi Aoki. CHAPTER 12 Industrial Design Rights: Malaysia Karen Abraham, Janet Toh & Tamara Lee. CHAPTER 13 Industrial Design Rights: Mexico Juan Carlos Suarez. CHAPTER 14 Industrial Design Rights: The Netherlands Kurt Stöpetie & Rutger Stoop. CHAPTER 15 Industrial Design Rights: Denmark and Other Nordic Countries Klaus Ewald Madsen & Arly Carlquist. CHAPTER 16 Industrial Design Rights: Singapore Gladys Mirandah & Juvelyn Cubilla. CHAPTER 17 Industrial Design Rights: South Africa Mike von Seidel. CHAPTER 18 Industrial Design Rights: Spain Gonzalo Ulloa & Álvaro de Castro. CHAPTER 19Industrial Design Rights: Taiwan Yu-Jiunn Kao & Frank Liu. CHAPTER 20 Industrial Design Rights: United Kingdom David Charles Musker. 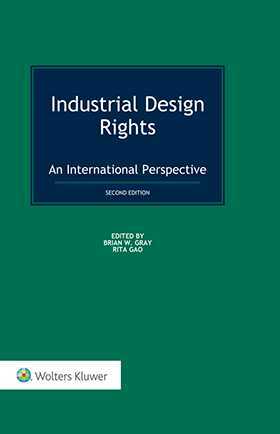 CHAPTER 21 Industrial Design Rights: United States George D. Raynal & Perry J. Saidman. CHAPTER 22 Industrial Design Rights: Venezuela Luis F. Elias.